The secret to successful conflict is knowing what you want to get out of the engagement before the opening bell. Machines have two primary functions: they perform the task they were built for or, failing that, they serve as emotionless objects through which we can vent our pent-up rage and frustration. Who among us hasn’t wanted to go all Office Space on the company printer? We slam our car doors, punch parking meters, and throw our remotes against the wall. (You guys do that, right?) And we take out our aggression without a hint of remorse because these are victimless drubbings. We’re thrashing machines, not people. Which is more difficult: persuading a hostage-taker to free his hostages and turn himself in, or developing an online reputation as an engaging and influential expert in your given field? Ending the hostage situation, of course. It is exponentially more difficult. But as vastly different as those two situations are, they do have one thing in common: they both follow a three-step path to success. In fact, hostage negotiators can teach you everything you need to know about successful social media engagement. So how to negotiators build relationships with hostage takers? The process is simple but not easy. 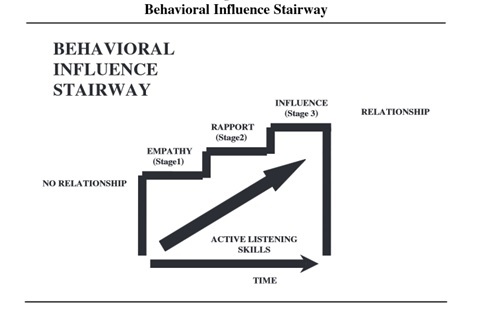 The Behavioral Influence Stairway Model, which is an updated version of the model created by the FBI’s Crisis Negotiation Unit, offers a great guide for establishing relationships online (and offline, too). It illustrates how active listening can help move you through the three stages of relationship building: empathy, rapport, and influence. Active listening is not just the driver in creating relationships in hostage situations—it’s also crucial for social media success. So what does it entail? It starts with understanding that you need to learn about the other person. Before you can connect, much less influence, another person, you’ve got to get a sense of who they are, what they believe, and where they want to go. You can’t assume that they share, like, or even understand your opinions, beliefs, or worldviews. The reverse is also true. Asking open-ended questions. This can be as simple as changing “Are you happy it’s Friday?” to “How has the week treated you?” Open-ended questions, which can’t be answered with yes/no, give the other person a chance to share more information. Paraphrasing. It’s a surprisingly powerful tactic on social media. Regardless of the platform, the ability to restate the gist of another’s argument is a great way to show understanding—for instance, paraphrasing the main thrust of another’s blog post before sharing a link to it. Emotional labeling. Putting a name to another’s emotional state demonstrates understanding and, when done properly, can reduce the intensity of their emotion simply by providing a name for it. For a more complete list of active listening tools (some of which aren’t appropriate for online communications), check out Eric Barker’s Time piece here. Ironically, the first sign that you are succeeding in your quest to use active listening to build a relationship is the emergence of empathy on your part. That’s right, the first step towards a relationship comes from you. Since you’re the one pursuing a relationship, it’s your job to put yourself in the other person’s shoes. Empathy is the foundation for all relationships, especially new ones. Social media imposes some barriers to establishing it, since you don’t always see or hear the other person. When that’s the case, more has to be inferred from bios, past posts, etc., so do your homework. Because empathy is what drives effective communication, connection, and change. This is a great time to start offering help or advice for problems that you have learned about from your active listening. Built upon empathy, rapport is a sense of mutual understanding. In this stage, the other person is finally joining you in forming a relationship. Their understanding of your understanding (empathy) is the basis for this common ground. And your empathy then gives insight into how to best communicate your opinions and goals. You have earned the right to be trusted because you’ve shown understanding of the other person’s point of view and hopefully helped that person solve a problem. In this context, influence “is the act or power of producing an effect without apparent force or direct authority.” This, for most people, is the goal of social media interaction: to cause behavioral change through the respect and connection that others feel for them. And it’s tempting, when you reach this stage, to view your job as done. Wrong. If you don’t maintain a constant—though perhaps reduced—flow of empathy and attitude of active listening, you’ll soon find yourself back at the beginning. If at any point the progression stalls—or if you screw up and start “falling down the stairs”—go back to the previous step. As you can see from this model, establishing influential relationships takes time and effort. And while you will have it easier than hostage negotiators, it makes sense to focus on a relatively few people at a time when seeking to expand your circle of influence on social media. Empathy is gaining some well-deserved attention these days. It’s an important part of everything from our species' survival to effective leadership to social media success. But what is it, exactly? It's often described as the ability to "walk in someone else's shoes" or "put yourself in their place." According to Merriam-Webster, empathy is “the intellectual identification with or vicarious experiencing of the feelings, thoughts, or attitudes of another.” These are all helpful in creating a shared understanding of the concept, but there's little here about how empathy works. "The perspective taking (PT) scale measures the reported tendency to spontaneously adopt the psychological point of view of others in everyday life ("I sometimes try to understand my friends better by imagining how things look from their perspective"). The empathic concern (EC) scale assesses the tendency to experience feelings of sympathy and compassion for unfortunate others ("I often have tender, concerned feelings for people less fortunate than me"). The personal distress (PD) scale taps the tendency to experience distress and discomfort in response to extreme distress in others ("Being in a tense emotional situation scares me"). I found these categorizations helpful because they identified specific ways that empathy evidences itself in our hearts and minds. And in doing so, the descriptions of these four kinds of empathy provide some excellent cues for people who are seeking to improve their own empathy. For instance, you could practice "perspective taking" in reading the newspaper or in everyday interactions as a way to increase your skill in seeing others' points of view. In your opinion, which of these facets is the most important? Many people are overwhelmed by the prospect of engaging in social media … and are then underwhelmed by the outcome. There are a number of mistakes or missteps that someone can make, but one of the biggest is the emotional approach you take. If you look at social media as a way to raise your profile and share your information, you’ve got a problem. Social media can do those things, but if you approach it as a constellation of free press release distribution systems, don’t be surprised if you don’t get much traction. Instead, approach it as a number of venues where you can demonstrate your prowess at being a friend. And how do you do that? Listen more. It’s impossible to learn about someone else if you don’t shut up. So pay attention to the problems, questions, and concerns of the online community you’re trying to join. Ask questions. This can be intimidating. So imagine yourself trying to get to know a new friend. How would you pose a question? What kind of things would you want to know about them? Reflect back. When chatting with a friend, you probably say things like “Oh, I hate it when people cut me off, too. It makes me so mad!” This kind of validation is surprisingly helpful in both in-person and online communication. It conveys understanding and empathy, creating common emotional ground. And who doesn’t want to feel understood and supported? Be generous with your support. You probably don’t keep a scorecard of how much you’re giving or receiving from a friend. (At least, I hope not.) Your first instinct is to give help whenever you can. So search out opportunities to do the same online. Don’t worry about the ROI, worry about being a friend. Be ready to apologize if you say the wrong thing. Misunderstandings happen. And they happen even more online and with people you don’t know well (or at all). But a genuine apology will go far to addressing these communication gaps and to keep the friendship rolling along. Stay in touch. If you’re like me, you’ve lost a number of friends due to neglect. Imagine how much easier it is for your online friends to feel ignored. Do you agree with this social media philosophy? What elements of being a friend am I missing? We’ve had a lot of fun picking at the bones of the 20th century mastodons that stampeded into the tar pits of the Interaction Age, but we haven’t witnessed one of those big boys going under in real time … until today. Considering the reaction to date from Xcel—and the energy utility industry in general—they may be right. In 2011, the good people of Boulder Colorado voted to wrest control of the power grid from Xcel and make it a locally owned utility. Xcel fought back by getting an initiative on the 2013 ballot that would scuttle the deal if it were to pass, setting up a showdown that will have profound repercussions for the utilities industry if Xcel loses. New Era Colorado got the jump on Xcel with a well-produced video that laid out their case for why voters in Boulder Colorado should not overturn the 2011 election results. The highlight of this video is the revelation (at 3:35) that there is a “textbook” published by the Edison Electric Institute that Xcel and other utilities are using to fight the growing movement to localize power supplies. The advice in this “textbook” on how to “nip the movement in the bud” made it quite obvious that this 11-year-old manifesto needs updating. In other words, “Like the U.S. Postal Service … utilities will continue to serve the elderly or the less fortunate, but the rest of the population moves on,” at least according to David Crane, CEO of NRG Energy, a wholesale power company based in Princeton, N.J. So learn from the mistakes of the once-masters of our universe. The days of talking to are over. You now have to communicate with your customers partners, honestly and transparently.